Renaissance School of Medicine at Stony Brook University. It’s far more than the new name for our medical school. It commemorates a transformative relationship that has propelled academic and professional excellence and innovation across Stony Brook University’s campus and beyond for more than 35 years. What’s more, it’s an enduring tribute to the bold thinking and selfless generosity of more than 100 families of Renaissance Technologies to Stony Brook’s students, faculty, patients and community. For Stony Brook University, our relationship with families of Renaissance Technologies has been a vital catalyst for our trajectory of innovation and excellence. Starting with a gift made 35 years ago by Jim Simons, former Stony Brook Math Department Chair, who incubated the company on the Stony Brook University campus, this relationship has resulted in more than $500 million donated by 111 Renaissance families. A lasting relationship, though, is based on more than donations. It's focused on a shared strategic vision for the future. The active engagement of these families has fueled research, technology and programs across the Stony Brook campus, sustaining our commitment to innovation and creating a true “renaissance” of academic and research excellence. In short, the right chemistry changes everything. 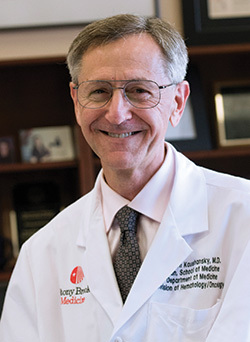 We invite you to learn more about the Renaissance School of Medicine at Stony Brook University, the top-ranked public medical school in New York State, and our three-fold mission: to train the next generation of committed, curious and highly capable physicians, advance our understanding of the origins of human health and disease and deliver world-class, compassionate healthcare.